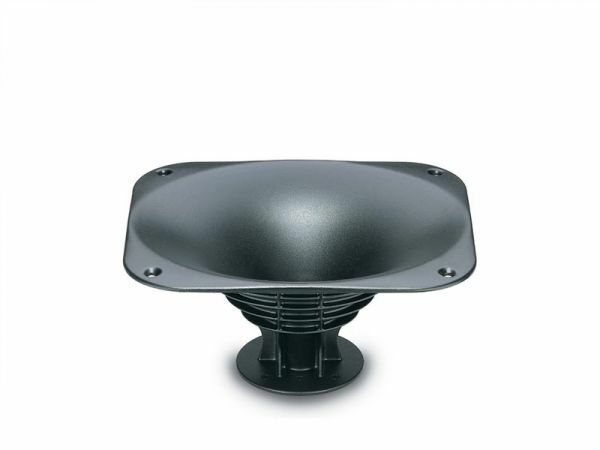 Featuring the unique Eighteen Sound elliptical shape (ESS technology), the XT1086 Constant Coverage High Frequency Horn has been designed for use in sound systems where the highest sound quality is required. With a 1 inch throat entry, the XT1086 has been designed to match the Eighteen Sound 1 inch exit high frequency compression drivers perfectly. The XT1086 maintains nominal 80° Horizontal x 60° Vertical pattern control. It provides consistent on-axis and off-axis frequency response from 1,4kHz to 16kHz in the horizontal plane and from 1,5kHz to 16kHz in the vertical plane. Horn directivity is constant from 1,4kHz. Thanks to its compact vertical mouth dimension, the XT1086 can easily be staked vertically when lower frequency control is required. The main innovation that the XT1086 introduces, is the improved external shape, providing high structural rigidity. This has been developed using exclusive a computer aided vibration analysis system. This product provides low distortion and a spherical wave-front, avoiding reflections and other disadvantages usually associated with diffraction horns. The die-cast aluminum construction provides optimum heat transfer, lowering the driver power compression and improving its general power handling capability. Weiterführende Links zu "18s XT1086"